Do you know where your candidates are coming from and how much they cost you to find? If your answer to either of those questions is negative, then you’ll want to check out the Jackson Physician Search ROI Calculator when it launches later this quarter. 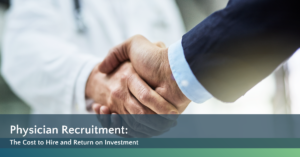 In today’s competitive environment, it is critical for healthcare facility administrators to understand how much return they are getting for each recruitment dollar spent. And even more importantly, how much the return could be if placements were made faster. Using the JPS ROI Calculator, you can look at your recruiting dollars in new ways by learning how much it costs when your time-to-fill averages are lagging. The ROI Calculator also illustrates, in real dollars, how much revenue is lost with each physician vacancy. Check out the ROI Calculator when it launches, and give Jackson Physician Search a call to learn how we can help improve your ROI. When it comes to Physician Recruitment ROI, there are three key concepts you should know. How to determine ROI, steps you can take to improve ROI, and the impact a physician recruitment partner can have on ROI. Our Regional Vice President of Recruiting, Christen Wrensen, presented the Digital Recruitment Strategy Guide to members of the Texas Hospital Association at their 2019 annual conference. This guide will help you quickly and cost-effectively engage the right candidates and score better hires. Not only are candidates scarce, but it is becoming more and more difficult to reach and engage them. 11% of Candidates are Actively Seeking – Searching for jobs. 76% of Candidates are Passively Seeking – Interested, but not proactive. 13% of Candidates are Not Seeking – Happy in their current position. Where are the passive candidates? Embracing digital media has become central to recruiting physicians and other providers. But, leveraging it successfully requires a keen understanding of the tools and the proficiency to effectively engage them. Click the download button below to view the entire presentation. 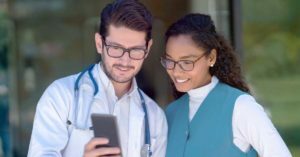 It is time to modernize your physician recruitment strategy by going digital. This is the first article in a two-part series on developing an effective digital recruitment strategy. Is your organization finding it harder to recruit physicians to fill your vacancies? Is the physician shortage costing your organization time and money due to turnover and hard-to-fill specialties? If so, then it is time to modernize your physician recruitment strategy by going digital. Increasing your social and digital marketing has become a critical component of any successful recruitment plan because it allows you to reach and engage the most physicians. Let’s examine why a digital recruitment strategy works in today’s physician jobs market. Only 11% of physicians are actively looking for a new job, and those will be the candidates that every recruiter is targeting. The key demographic is the 76% of physicians who are receptive to new opportunities but are NOT proactively searching. Finding out who these physicians are and how you can engage with them may not be as difficult as it seems because each of these potential candidates are active on social and digital media sites. These passive candidates can be targeted and engaged with on sites like LinkedIn, Twitter, Facebook, and Doximity. A smart digital recruitment strategy may include sponsored ads on these social channels and be uniquely targeted using specific characteristics like specialty, behavioral metrics, and even demographics. If you need further convincing, consider that 94% of all physicians use their smartphones for professional reasons, while 87% between ages 26 to 55 are using social media. Now that you have a clear understanding of why you need a digital recruitment strategy let’s get into what it entails. A digital recruitment strategy is more than periodically posting content on social media sites. To use social and digital media effectively, you need to invest in several key components. Creating a digital recruiting strategy is a major investment. Since we know that most physicians are using their smartphones for their personal and professional life, your website should be optimized for mobile viewing. We also know that 91% of physicians prefer to receive job opportunities via email, making an Email Marketing System a wise investment. Investing in subscriptions to several top job boards will also help you reach more physician candidates. An important part of your digital recruitment strategy is understanding how to create and enhance your digital networking. Having key team members learn more about how they can expand their digital footprint also serves to build your organization’s brand. It is also critical that your team utilize effective communication techniques to ensure that your messaging and content is consistent and engaging. There is no shortage of communication experts who can provide your team with the best practices and keys to more effective communications. As you learn more about effective communications in a digital landscape, you can utilize that knowledge to build more effective and engaging job ads. Passive candidates need a reason to “click through” to learn more about an opportunity. Another important component to work on is growing your social media network and your digital presence. 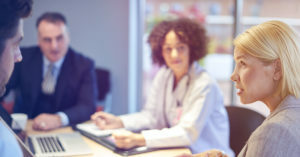 Your organizational brand and corporate values should play a prominent role in your digital presence enabling you to connect with physicians who are in alignment with those values and are predisposed to being a cultural fit. Obviously, developing an effective digital recruitment strategy contains a lot of up-front costs and will require some key decisions to prioritize what you can invest in and when. In the next article on developing a digital recruitment strategy, we will take an in-depth look at candidate sourcing and effective digital recruiting activities that you can put into practice immediately. 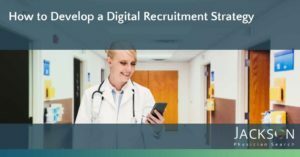 For more information about developing a digital recruitment strategy or to secure a recruitment partner that understands the digital landscape, contact Jackson Physician Search today. 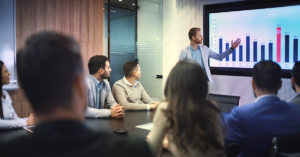 The combination of the current workforce shortage and an ineffective recruitment strategy can be costly to your organization and the community. For several years now, healthcare industry thought leaders have been telling us that there was a looming physician shortage on the horizon. Initially, it was reported that primary care was going to be the hardest hit because of an aging baby boomer population, an influx of newly covered patients through the Affordable Care Act, and the fact that over 30% of active physicians will be 65 or older by the year 2030. The initial primary and urgent care perspective still rings true. However, the physician shortage is actually impacting specialties across the spectrum of care. According to Association of American Medical Colleges (AAMC) research data, the primary care shortage can be as many as 43,100 by the year 2030, while non-primary care specialties may experience a shortfall of up to 61,000 physicians. Within those numbers, certain specialties, such as emergency medicine, neurology, psychiatry, anesthesiology, and others may experience a shortage of between 18,600 and 31,800 by the year 2030. As concerning as the data is currently, it may actually get worse before it gets better. There is a large segment of our population that remains underserved. According to AAMC data, as barriers to utilization are lifted through health law changes, more non-insured Americans are accessing health care. Studies show that if all Americans accessed health care at the same levels as those who have typical employer-sponsored health care, we would need close to 100,000 additional physicians to provide their care. 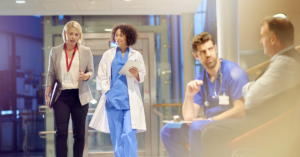 There are no easy solutions to resolve the physician shortage crisis, but here are a few things worth keeping an eye on throughout the rest of 2019. Increase residency programs. Medical schools have taken steps to increase class sizes, yet the federal bureaucracy hasn’t increased support for residency programs commensurately. The AAMC is calling on lawmakers to increase residency slots by an additional 3,000 annually for five years to support an increase in practicing physicians. Streamline licensing process for international medical school graduates. Did you know that almost 25% of today’s physician workforce are international medical graduates? Studies show that while these international graduates provide care on par or better than U.S. trained doctors, they face a cumbersome and complex licensure process to practice here. Further, they are required to complete redundant training programs here in the U.S. before licensure. At the risk of oversimplification, lawmakers and healthcare industry leaders should be able to resolve this by promoting legislation that simplifies the process. Rising salaries and creative compensation. Since 2013, salaries for Primary Care physicians have risen 10%, and in many cases more based on geographic location. Because competition for physician services is so fierce, healthcare organizations are finding new and creative ways to entice candidates to their vacancies. Signing bonuses and tuition repayment is one way that physicians are making more money, but other enticements include flexible scheduling, reduction or elimination of “call,” and much more. Facilities in rural and underserved areas are feeling the recruitment crunch because the enticements they used to be able to offer exclusively, are now becoming commonplace. Balancing non-physician utilization and technology. Most organizations have focused their physician shortage efforts on developing a greater reliance on non-physicians. Nurse practitioners, physician assistants and locum tenens are all being used in greater numbers to fill workforce vacancies. Additionally, technologic innovations can also serve to increase access to care and increase the efficiency of monitoring and managing a chronic condition. Mobile health technology and the utilization of biometric sensors are increasingly more popular among individuals who are interested in being more involved in their healthcare. Jackson Physician Search can help your organization address both short- and long-term physician shortage strategies. Our recruitment professionals have decades of industry experience, and our thought leadership can provide you with proven strategies to improve your physician recruitment and retention programs. Contact us today to learn more. 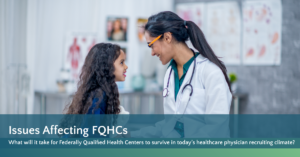 As physician recruitment becomes even more competitive each year, Federally Qualified Health Centers (FQHC) are feeling the brunt of the challenges. Jackson Physician Search, in partnership with CommonWealth Purchasing Group, recently published a white paper on the Issues Affecting FQHC’s. Here is a brief synopsis of the major talking points. The National Association of Community Health Centers is reporting that at least 95% of all health centers are reporting a clinical vacancy, with 70% of those being a physician opening. Because CHC’s are expected to be managing the care of more than 35 million patients by 2020, not having candidates to fill vacancies is going to be impacting communities across the United States. As you might expect, primary care is the hardest hit regarding vacancies, but keep in mind that CHC’s are providing a broader range of services than traditional primary care. Reports show that less than 6% of medical students plan to practice Family Medicine and 2% are pursuing internal medicine. In years past, CHC’s would promote “non-monetary” benefits to practicing in a CHC. Things like a better schedule and quality of work/life balance, all used to be part of the draw to a small health center. Those advantages are no longer exclusive to CHC’s and rural practice settings. Now, hospitals of all sizes are using every means available to attract qualified candidates in this highly competitive recruitment environment. Salaries and sign-on bonuses are rising, loan forgiveness is being offered, and FQHC’s are having a difficult time keeping pace. Develop a Brand Strategy and Recruitment Marketing Plan – Less than 25% of FQHC’s have a fully implemented marketing plan. Physicians today are more interested in things like organizational culture and work environment than in years past. This is an area that a smaller health center can excel at if the time and attention is paid to developing a winning brand that highlights culture, values, and work/life balance. Develop Local and Regional Outreach Campaigns – FQHC’s can compete through the development of training partnerships with local or regional academic institutions. Attracting and retaining local talent can be accomplished with a solid brand strategy, promoting training partnerships, shadowing and mentor programs and other similar community relationships that draw candidates into a facility. Create a Comprehensive Retention Program – Recruiting a physician is only one-half of the battle. Having to replace a physician can take as long as 24 months and cost more than $500,000. By developing internal systems that monitor physician and staff satisfaction and continually cultivate a positive workplace culture, health centers can proactively achieve better retention. Also, by focusing on the type of employee that embodies their culture, they are prone to attract and hire individuals who fit that culture. Review Your Compensation Model and Delivery Team – Health centers are no longer able to get physicians “at a discount.” Salaries are much more competitive today across all practice settings, so CHC’s are being forced to be more creative. Implementing productivity metrics is one way to improve a physician’s base salary. CHC’s are also more commonly offering 3- or 4-day work weeks as a quality of life benefit. This trend coincides with the utilization of more nurse practitioners and physician assistants to supplement the staff. There is no simple answer to how FQHC’s can compete in the ultra-competitive physician recruitment and retention environment. What is required is a fully developed strategy that incorporates many or all of the elements identified. As Community Health Centers continue to play an integral role in the healthcare industry and more importantly in helping the patients and communities where they are located, it is critical that we as an industry support their needs. If you are looking for a partner with the resources, experience, and nationwide reach to help solve your critical recruitment and retention challenges, contact Jackson Physician Search and find out how we can help today. This is the final article in an ongoing series summarizing the findings in a recent white paper published by the President of Jackson Physician Search, Tony Stajduhar. To read “Physician Recruitment: The Cost to Hire and Return on Investment” in its entirety, find it here. The physician shortage is our current reality across the healthcare industry. Treating it as anything less than an urgent situation is a step closer to a financial cliff. Your key consideration in all of this is how well your recruiting and hiring process is working. If your recruitment process is broken and your time to fill rates are lagging, then the chances are you are going to end up with a bad hire anyway. The time to invest in the implementation of key best practices to improve your hiring process and create success in the recruitment process is now. 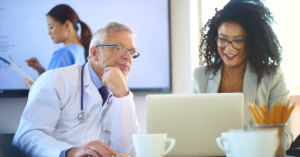 Here are a few ways you can close your physician recruitment gaps, improve your hiring process, and see a better return on investment. Continuous Recruiting – Just because you have identified a group of candidates and scheduled interviews, don’t stop recruiting. It is important to continue the process until you have a signed contract in hand. Why you ask? First, at any point in the process, you may find yourself back at square one due to unforeseen circumstances. Second, you need to maintain your leverage throughout the negotiating process and keep your potential candidates engaged. Lastly, it is important to create a memorable experience for the candidates you meet to keep your referral pipeline full and also keep them engaged for future needs. Don’t Get Stuck on Cost per Hire – While the cost per hire is an important metric, viewing your recruitment process in its entirety allows you to measure whether or not you have made a good hire in the long run. The quality of hire impacts your return on investment because of turnover, loss of patient loyalty, quality of care, and other issues. Strategic Partnerships Can Improve ROI – Sometimes finding the right strategic partner is the key to improving your recruitment process. Smaller systems or community health centers may not be equipped to cast a wide enough net to attract the right candidate to a position. 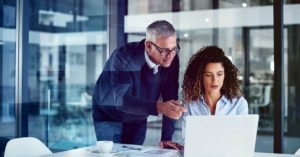 Finding a partner that can manage the digital tools available and has a trusted reputation in the industry will allow your key internal leaders to focus on creating a quality interview process and keeping the process on track. Paint a Better Picture – As a candidate goes through the recruitment process, there are many considerations that they are internally processing. For example, is the community a place that is a good fit for their family? They are going to be assessing your workplace culture and whether or not they can envision themselves fitting in and contributing. Far too often, the process gets bogged down by paperwork and non-human considerations. Instead, create an onboarding process that caters to them as a person and their family as a whole. Highlight the community, the schools, and the things that will engage them in the longer term. Focusing on the person first creates an environment that builds trust, rapport, and retention, not to mention word of mouth that benefits your referral pipeline. If your organization is suffering from a lackluster recruitment process or is saddled by too many bad hires, we can help. Jackson Physician Search has the experience, nation-wide reach, and industry knowledge to help you streamline your recruitment, hiring, and retention process. Contact our team today and find out how we can be the strategic partner you need. What is the ‘Physician’s Contribution’ Really Worth? This is the third article in an ongoing series summarizing the findings in a recent white paper published by the President of Jackson Physician Search, Tony Stajduhar. To read “Physician Recruitment: The Cost to Hire and Return on Investment” in its entirety, find it here. In our last article, we looked at how organizations can utilize benchmarking to drill down and find the true costs of your recruitment and hiring process. While it is important to benchmark against national medians to understand how physician compensation and your recruitment costs will impact your return on investment, it doesn’t tell you the whole story. Other variables that play an important role in ROI consideration are payer mix, your market’s clinician supply/demand, quality incentive payouts, and cost of living. 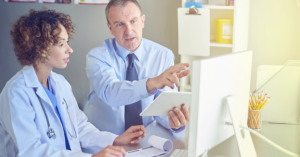 Finally, a big piece of the puzzle that often gets overlooked is ‘Physician Contribution.’ Simply put, physician’s contribution relates to the typical inpatient and outpatient revenues, referral revenues, and other incomes not directly related to patient care. For example, a primary care physician can generate as much as $1.5 million in indirect revenue, from labs to imaging, and hospital admissions. Additionally, as much as 10% of primary care visits result in specialty referrals! While examining the data, it is easy to pinpoint your revenue generation indicators, what your specific referral ratios are for each physician by department, and more. With that, you are still missing pieces of the revenue puzzle. Physician’s contribution also includes non-monetary benefits that can’t be discounted. Non-monetary conditions include better staff morale and patient satisfaction because the department is fully staffed. Patients are less likely to migrate to a new provider because their needs are being met in an environment that is noticeably more efficient and timely. Physician retention and overall organizational culture will improve leading to lower turnover, shorter vacancies, and improved fill rates. It is important to recognize the link between a healthy culture and physician recruitment and retention. Healthy workplace culture is not a condition that is hidden from view. Being recognized as a great place to work is generally known within community circles and any physician, or any potential staff member, doing their due diligence on a job opportunity will learn that information. Organizations that aren’t focused on creating a healthy culture will ultimately pay a price. Research demonstrates a direct link between culture and performance measurables related to healthcare. In a healthy workplace culture where the clinical staff understands their role and how it relates to the organization’s mission and values, you can find a 33% increase in overall quality. If your organization is behind the curve on developing and maintaining a healthy culture, or if you are looking to improve your recruitment and retention process, contact us today and find out how Jackson Physician Search can help. This is the second in an ongoing series summarizing the findings in a recent white paper published by the President of Jackson Physician Search, Tony Stajduhar. To read “Physician Recruitment: The Cost to Hire and Return on Investment” in its entirety, find it here. In our first white paper summary, we highlighted how much vacancies are costing healthcare organizations. Now, let’s focus on how much it costs you to recruit and fill those physician vacancies. As if healthcare organizations don’t lose enough revenue by having lingering vacancies in their physician ranks, having an inefficient recruitment process not only wastes time and money, it also keeps the vacancy open longer. Benchmarking your recruitment process from top to bottom allows you to reveal inefficiencies and make the necessary corrections for improvement. No matter how successful your recruitment process may have been in the past, as times change and the candidate profiles change, what worked yesterday doesn’t necessarily work today. 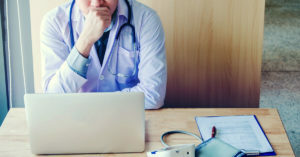 A recent survey found that 95% of physicians want to receive job information by email, but the volume of contacts they receive are watering down the effectiveness of solicitation. Over 39% of physicians report multiple job solicitations each week. Compounding the issue is that doctors are finding that they are receiving relevant information less than 10% of the time. It is critical for organizations to do a deeper dive into creating targeted emails that resonate with the recipients. Refining the email content to be more relevant can be achieved if you are collecting the data and acting upon the results. An effective way to engage physicians who may be interested in a career move, is through social media, as a surprising 87% of physicians between the ages of 26 and 55 are using social media platforms. The key for savvy healthcare organizations is to attract passive candidates by producing fresh, interesting content that sets you apart from your competitors. If physicians are drawn to your content because it piques their interest, you are essentially recruiting them before they even know it. If you feel that your recruitment process is suffering from the same old, same old and your vacancies aren’t being filled in a reasonable timeframe, it may be time for a total recruitment makeover. 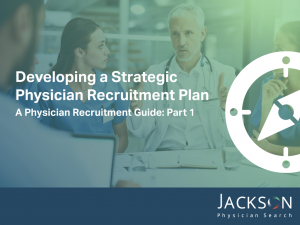 Check out our ‘Guide to Developing a Strategic Physician Recruitment Plan’, or contact a Jackson Physician Search recruitment professional today.